You should get to know the steep and sharp coastline of Gran Canaria by JetSki. You can sweep over the waves of the Atlantic at more than 100 kilometers per hour with these power packages - if you want! However, today, you are going to explore Gran Canaria by Jet Ski! And while you cool down from top to bottom with the whipped water fountains and the wind during your ride, the adrenaline pushes the heat back into every single part of your body. You hardly have time to admire the uniquely beautiful southwest coast of Gran Canaria, because every wave you encounter lifts your fiery vehicle - with you on top of it - over the water surface and gives you a short, but violent flight. 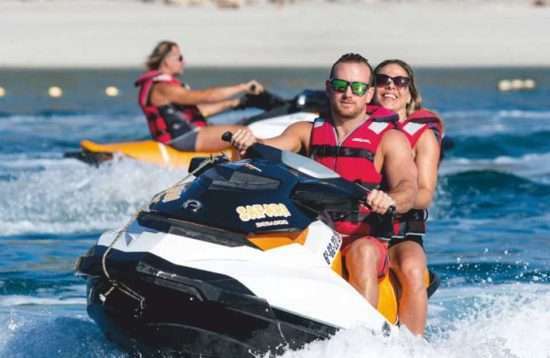 The name JetSki - called Moto de Agua on Gran Canaria - is actually a trademark secured by Kawasaki, but over the years it has prevailed as a general term for these jetboats. There are two different models: The JetSki to stand on and the one to sit on. 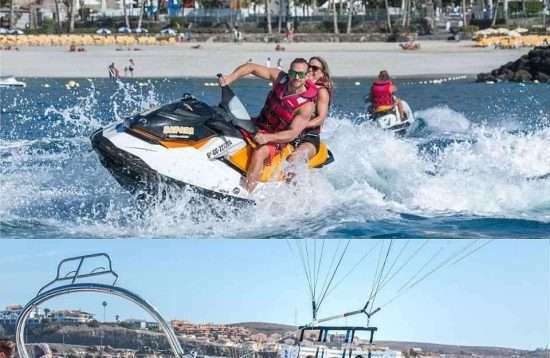 There are JetSki on Gran Canaria that can accommodate up to three people. Their body is usually made of glass fiber reinforced plastic. The water-jet-drive has an internal and encased propeller (Impella) and is powered by an internal combustion engine, which can have up to 300 hp and can reach speeds of up to 100 kilometers per hour. You accelerate with a rotary switch and brakes simply do not exist. You can only slow down the Jet Ski by removing the gas. Therefore, you should not put yourself in a situation that would require emergency braking. Your wrist is connected to the so-called Quick Stop trough a band, in case you fall off, the engine is switched off immediately. Impella and Quick Stop make JetSki riding on Gran Canaria safe for you and also for swimmers. First, you should have a certain physical condition. The minimum age for driving a Jet Ski is 16 years in Gran Canaria. Co-driving is possible from the age of 6 years. You must be able to swim well of course. And you should have no cardiovascular diseases or serious back problems or injuries of the musculoskeletal system (especially the knee). It is unnecessary to mention that you need to be free of alcohol or other drug-related influences. If you have a sports boat license, you can rent a JetSki on Gran Canaria and go exploring on the Atlantic Ocean on your own. 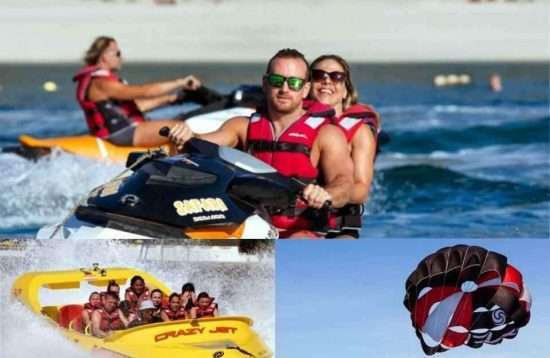 Otherwise, you can book a guided JetSki Safari with one of the numerous water sports providers in Gran Canaria or drive some rounds within the JetSki course marked on the sea. It is important to follow a few safety and traffic rules. If you violate these, it does not only endanger yourself and others. The water police are also quite attentive in the waters around Gran Canaria and don’t hesitate when it comes to distributing hefty fines. The minimum distance to other JetSki riders in your group and other vessels has to be at least 100 meters. Turning pirouettes is prohibited as well as throwing garbage in the sea. A distance of 200 meters has to be kept to port entrances, anchorages and berths, unless you want to enter there. The maximum speed in the port is about 2 knots, which is a little less than 4 kilometers per hour. 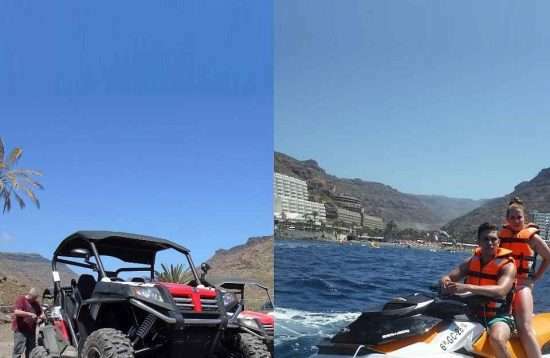 On Gran Canaria there are a few ways to have fun with a JetSki. You will find a provider in basically every major resort. Consequently you can drive JetSki in Playa del Ingles, as well as in Puerto Rico JetSki. You will also find water sports centers at the beaches Anfi, Arguineguin and Taurito. Only Amadores and Maspalomas don’t have a water sports center. But no matter where you spend your holidays in the south of Gran Canaria, most of the provider pick you up from your hotel and bring you back. Although there are numerous providers, the prices for JetSki driving on Gran Canaria are all very similar. 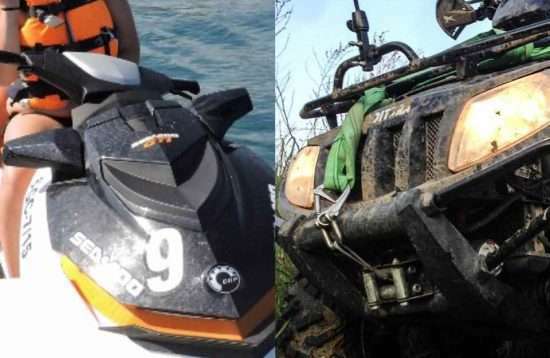 Please do not forget to wear a lifejacket while jet skiing. Solid shoes that you don’t mind getting wet can be worn. Ideal are glasses with a rubber band that protect you from water splashes. It is best to wear swimwear or a wetsuit under the lifejacket. 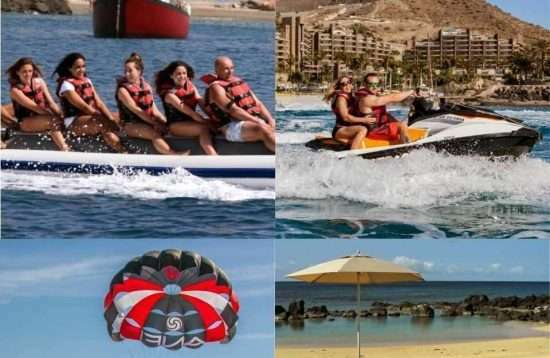 On Gran Canaria the lifejackets are available for rent as included in the price by the JetSki providers.